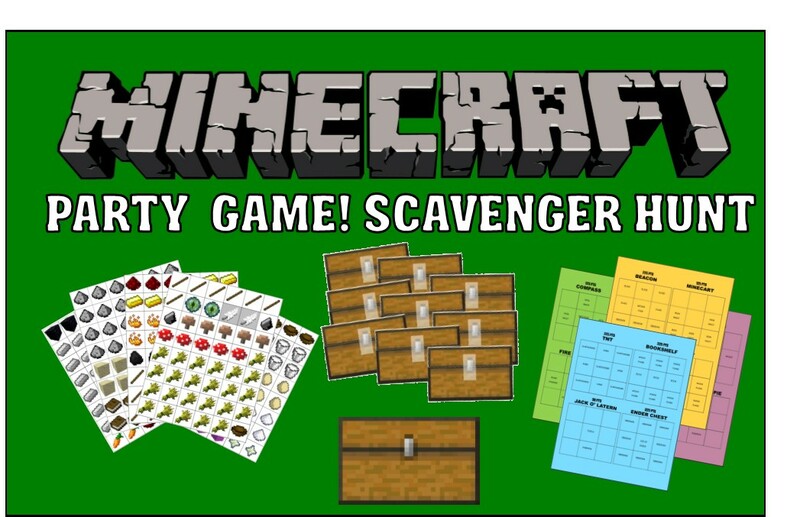 Minecraft Party Game - Printable Scavenger Hunt! Ok, all my children from the 7 year old to my 14 year old are obsessed with Minecraft right now. 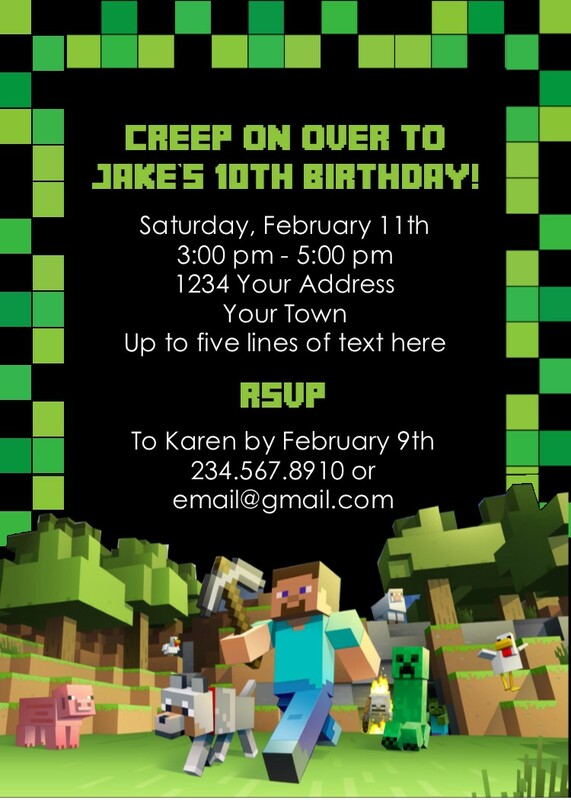 A Minecraft party theme was bound to happen, but what to do for games. I didn't want to invite all my sons friends over to sit and take turns playing a video game so I came up with this Minecraft party game of my own. 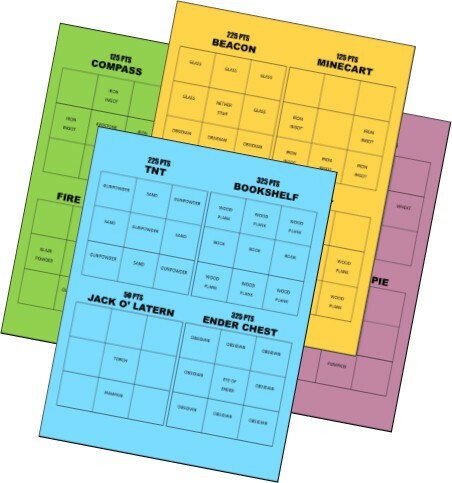 This printable scavenger hunt is made to be easy for busy moms like me to set up and play. All you need to play besides the printable hunt itself is a stapler, tape, paste, and hiding locations. You can hide the pieces anywhere! This game is great for indoors and outdoors. It takes about an hour to play! Complete details below! 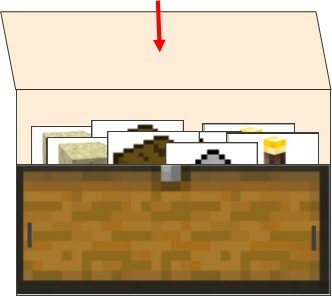 How does the Minecraft printable scavenger hunt work? Players are divided into four teams. Their goal is to locate the treasure chests located throughout the party area. 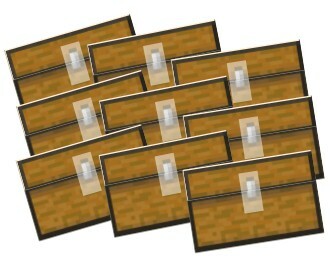 Each chest is filled with Minecraft items (ingredients). 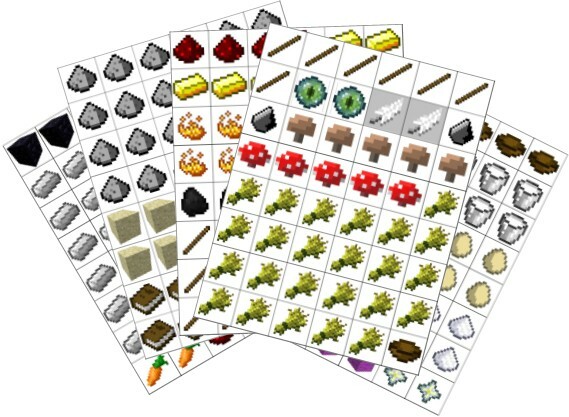 The teams must use these minecraft items to create recipes from the game. In Minecraft a recipe is simply ingredients put together that will create a certain item in the game. For example if you place a pumpkin and a torch together they become a jack o' lantern. This printable game comes with 18 recipes (ones from the actual minecraft game) that the players will try and find the ingredients for. Once they find the ingredients they will put them in the correct place in there hunt guide. The hunt guide is given to each team before the game. The guide list the recipe and shows where each item goes to create it. If they all the ingredients for a recipe they will put them in the correct place in their hunt guide and at the end of the game they will be awarded points for each recipe the complete. What age is the Minecraft scavenger hunt best suited for? Ages 6 - 14. Players do not have to be knowledgeable about the actual video game to play, but they will need to know how to read or have help. How many players can participate in the party game? Players are divided into four teams. It is recommended that each team have 2 -5 players in it, but it can also be played with individuals if there are only four players. How long does it take to play the game? The game is played in a given amount of time. I suggest 45 minutes, but if you feel the players could use extra time you can adjust it. For younger players it is often adjusted to an hour or more. Add in five minutes to explain the rules, and some more time at the end to add up the points for each team. What kind of paper should I print this on? For most of the items I would say plain 8x11 copy paper will work fine. The ingredients need to be printed in color. The hunt guides can be printed in black only, but you can spruce them up if you want by printing on colored paper. For the treasure chest I would recommend 8x11 card stock. The chests also need to be printed in full color. What does the hunt include? Treasure chest printables with how to assemble instructions. Assembly is simple as cut and fold twice, staple the sides and tape shut. Hunt guides for each team that feature 18 recipes. Once you are finished editing just print on cardstock (or any paper of your choosing) and send! Easy as pie - and saves you TONS of time designing your own or killing your hand filling out a dozen pre-made ones.